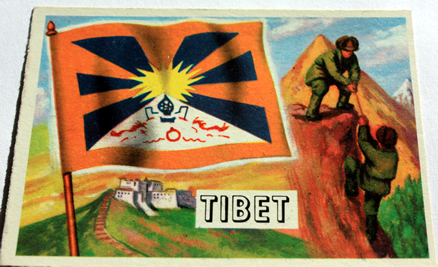 In 1959 the very year that saw the Lhasa Uprising and eventual flight into exile of the Dalai Lama ABC released a series of cards called ‘Flags Of The World’ which featured at Number 52 the Tibetan national emblem, the front cover design is shows Tibet’s flag, the Potala Palace, mountains and what looks to be two climbers in Chinese-looking military uniform. 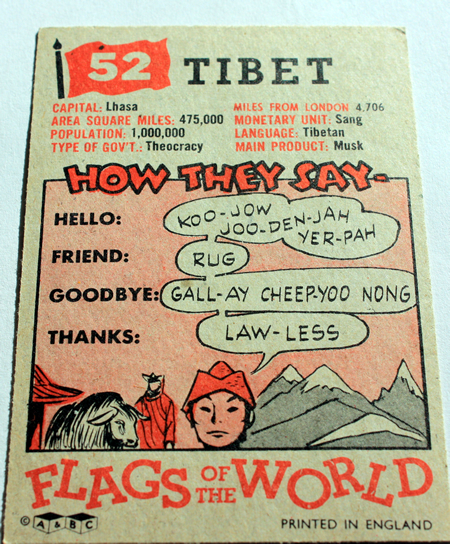 The reverse features basic information about Tibet along with some Tibetan phrases, illustrations of snow-mountains, a yak and what maybe be thought of a lama-type figure. Apart from the collect-ability and curiosity of this card above all it reveals that at one point children across the USA and England were being informed (in the dark-ages of pre-internet) of Tibet’s nationhood. Shane many thanks for taking the time to share, it’s really appreciated. Such comments are to be expected from an individual who has been advocating the surrender of Tibet’s nationhood since his appointment to office, a similar appeasement was on display during last week’s meeting in New Delhi, promoted as the ‘Tibetan People’s Solidarity Campaign’. 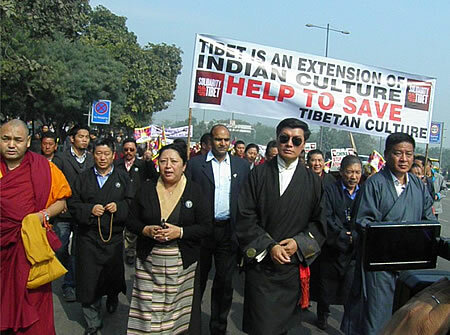 The event, featuring prominent Tibetan and Indian speakers, drew several thousand people and launched a series of events across India and beyond, including a march lead by Doctor Sangay and his colleagues. It attracted the uncritical support of Tibetans and has been widely promoted across the Internet on social sites such as Facebook, yet a closer look at this campaign reveals it to be not entirely what it seems. No one publicly has even questioned with what exactly is the outpouring of solidarity dedicated? Is it directed towards the Tibetan struggle inside occupied Tibet? 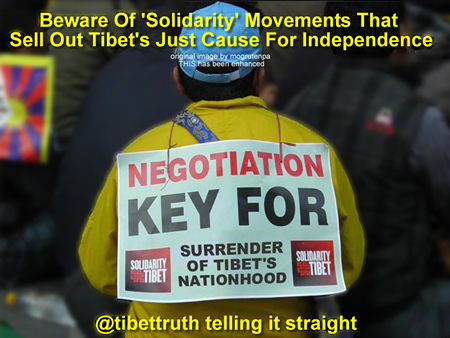 An action offered unreservedly in support of the demands made by the Tibetan people for independence? Does it have an altogether different purpose? Although hidden in plain sight, and thankfully invested with integrity by individual Tibetans who chose to carry their nation’s flag (take note Doctor Sangay) anyone with an eye for detail could not fail but notice indications that this campaign had been engineered by Lobsang Sangay and his advisers as a public mechanism to promote what has been a recent re-branding of the Tibetan issue. At this stage it’s useful perhaps for those with little knowledge of Tibet’s cause to offer a brief breakdown. In essence Doctor Lobsang Sangay and his Administration have inherited, and become very enthusiastic advocates of, a strategy first proposed by the Dalai Lama in which Tibetan independence is abandoned, in favor of improved cultural, social and local governmental autonomy. Known as the Middle Way policy it has proved a singular failure, a reality conceded by the Dalai Lama during a television interview. Despite being forcefully and consistently rejected by China’s regime, this proposal, formalized into a written document; the Memorandum On Meaningful Autonomy For Tibetans continues as the central strategy of Doctor Sangay’s Administration. Now before the suicidal compromises of that proposal are considered China’s authorities have to be ‘encouraged’ to continue with what have previously been fruitless negotiations. The Chinese leadership has made a number of thoroughly inflexible demands while remaining deeply suspicious of, and hostile towards these proposals, claiming them to be no more than a disguised attempt to restore Tibet’s sovereignty. This has resulted in the exiled Tibetan leadership jumping through an endless series of hoops in an effort to assuage Chinese suspicions and prove that it is acting in good faith. Within this context there is for Lobsang Sangay at least, no place for Tibet’s rightful nationhood and independence, as those issues are far too toxic and would mean the demise of ongoing efforts to seek negotiation with China. This then is the background, the corrosive forces operating behind the so-called ‘Tibetan People’s Solidarity Campaign’ which explain the words of appeasement from Doctor Sangay, remarks that trample across the common political aspiration for independence expressed by decades of Tibetans protests in occupied Tibet. 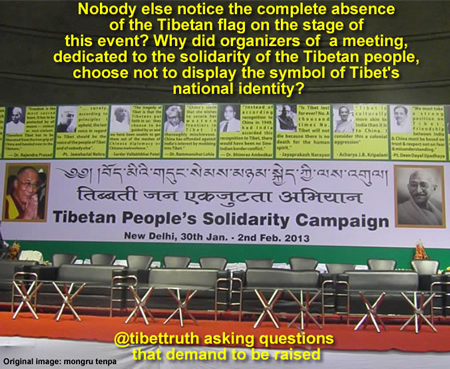 In light of these circumstances was it any surprise that organizers of the meeting in New Delhi chose not to display on stage a single Tibetan flag, a symbol of Tibetan national identity, was it considered an action too negative for Chinese consumption? Did such considerations equally inform the timorous wording of the orchestrated slogans, which were made available by the exiled Tibetan Administration to participants? The on-stream message of the event was tightly focused upon saving Tibet’s culture, protecting language, appeals to China to act compassionately, and requests for international and media support. Clearly the campaign was no display of political solidarity with the quest for Tibetan independence, but part of continuing restructuring of the Tibetan cause, imposed by an elite desperate to satisfy Chinese demands. Meanwhile inside occupied Tibet the resistance to China’s illegal and brutal occupation continues, Tibetans face torture, forced labor and Chinese bullets to demand Tibetan independence, while in exile a handful of prominent Tibetans seek surrender with China and mobilize Tibetans onto the streets to support what has proved an inane and vacuous policy of appeasement. The people of Tibet deserve so much more than this cynical betrayal, they have every right to expect a genuine solidarity movement, in unison with their just struggle for an independent Tibetan nation. 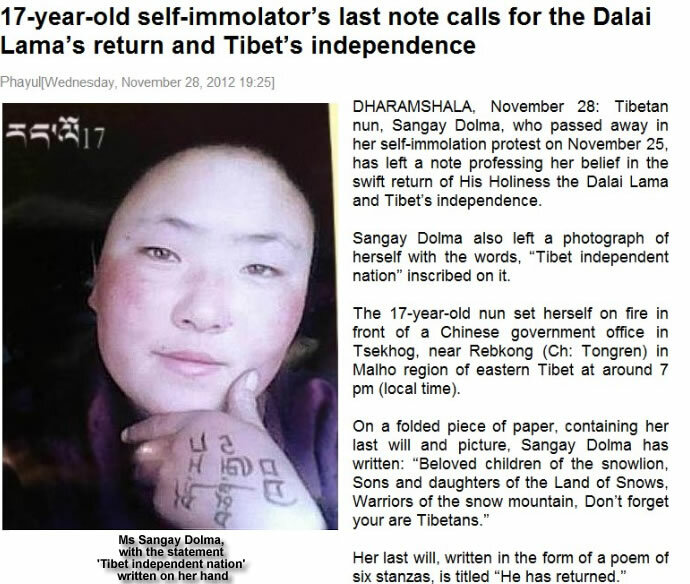 We respectfully suggest to Doctor Lobsang Sangay to consider the heroism, patriotism and sacrifice made by Sangay Dolma, who on November 25, offered up her life in fiery sacrfice to assert Tibetan independence. Report HERE Perhaps next time the exiled Tibetan ‘political leader’ repeats his jaded mantra that ‘we (sic) are not seeking independence’ he will hear how hollow and bogus such a claim truly is! Congratulations and respect to the Tibetan Youth Congress (TYC) on the commemorative date of its founding. In 1970, the TYC was established in Dharamshala (Northern India) with the blessing of His Holiness the Dalai Lama. 315 delegates from 16 different Tibetan communities in India and Nepal attended. The founding of TYC in 1970 came at a time when the first group of young Tibetans who had received a balanced modern and traditional education were graduating from schools and colleges. TYC’s constitution, aim and objectives, and organizational structure were decided, and the first Central Executive Committee (CENTREX) elected to lead it. 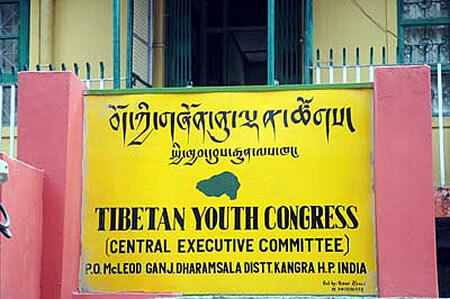 The movement gathered momentum with set-up of regional chapters, called Regional Tibetan Youth Congress (RTYC). With two more Tibetans self-immolating this week we are again seeing a despairing response from within some sections of the exiled Tibetan community, people are asking in what way are such sacrifices securing either the attention of a largely indifferent world, or advancing the cause of Tibet’s independence struggle. These are entirely understandable reactions to what are painfully distressing events, yet in a key sense they are the wrong questions, as they are based upon an erroneous understanding that these actions seek a global response, an international condemnation to China’s tyrannical occupation of Tibet. Sure, it would be extremely welcome to see a concerted and forceful response from the international community to the horrors of China’s human rights atrocities against Tibetans. Yet the political and economic interests of nations ensures a shameful appeasement of China, faces turning away from the decades of suffering endured by Tibet, relieved only by platitudes and hand-wringing. 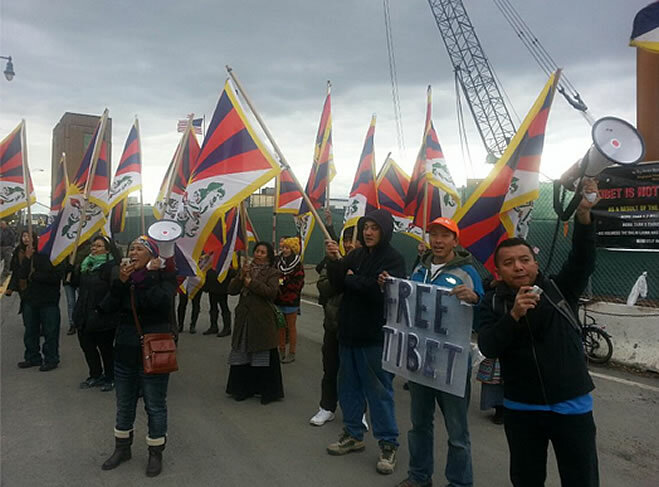 Recall the assurances of the United Nations to the Tibetan hunger-strikers earlier this year? In which, fearful of the prospect of Tibetans starving to death on its New York doorsteps, the UN promised a detailed and urgent investigation into China’s actions in Tibet. 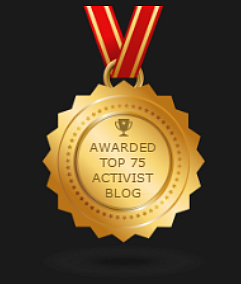 Thus far silence, evasion and inaction has followed. So the fiery sacrifices of these Tibetans, even were they seeking international support for Tibet, would; due to the marble-heart of realpolitik, remain ignored or at best offered disingenuous words of concern, measured so as not to offend China. It is fatuous to even consider that these actions are in themselves trying to secure independence for Tibetans, which inevitably invites the questions, what is the purpose of such sacrifice and who is the intended audience? Perhaps these self-immolations are more accurately understood as expressions of resistance, in which it is the action itself that is the protest, a declaration of Tibetan independence and loyalty to the Dalai Lama. They also defy China’s occupation and are a dramatic reminder that the spirit for Tibet’s national freedom and identity remains undiminished. The sight of Tibetans engulfed in flame, holding aloft the symbol of Tibet’s independence must also have an incredible impact upon the local Tibetan community where they occur, no doubt generating sadness and anxiety but also reinforcing a sense of solidarity, national identity and encouraging a determination to oppose China’s occupation. They are after all heroes, but the political nature and objectives of their protests sits uneasily with the current position of the Tibetan Administration, keen to avoid mention of Tibet’s independence and desperately trying to assure China that it seeks only improved autonomy under Chinese rule. Aware though of the profound support and emotion within the Tibetan Diaspora towards those who self-immolate, it has to be seen to show respect and honor such sacrifice. Yet it does so by avoiding any mention of the political demands made by such Tibetans and chooses to represent their actions as a response to China’s policies, or as the only, desperate, means of protest due to the intensity of China’s suppression of Tibetans. 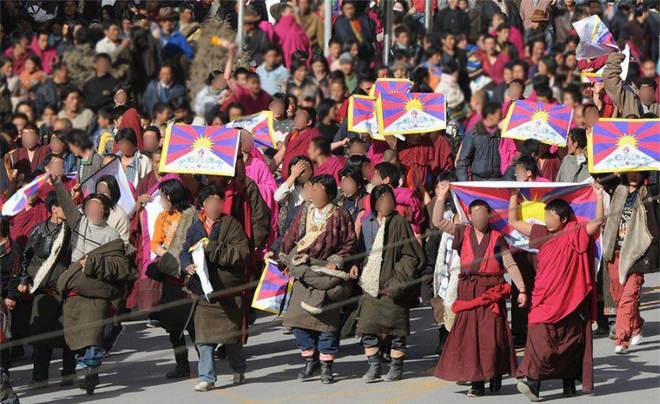 While there maybe a shadow of truth in that for the most part this is a political and cynical version of events, designed to dilute, evade and ignore the central objective common to the majority of such protest, Tibetan independence. Let us journey to an alternative landscape for a moment, a flight of fancy in which these Tibetans are embraced as they should be by their exiled Administration, as inspiring martyrs to Tibet’s true cause, a reminder to Tibetans everywhere that the only solution that guarantees genuine protection and respect of Tibet’s culture and national identity is the restoration of its independence. Imagine the effect upon the exiled Tibetan community if their sacrifice was seen, not only in terms of tragedy and pain, but as selfless inspiration and courage. Would such a re-interpretation be followed by questions as to why they are offering their lives to asserts Tibet’s rightful national independence yet in exile their Administration is surrendering Tibetan nationhood in exchange for Chinese rule? These individuals are sending an immensely powerful message, not to the corrupted offices of the UN or Washington DC, but to fellow Tibetans, is their overtly political sacrifice being understood or is it getting lost in the emotional response, the massed prayers and despair and frustration felt among exiled Tibetans? It has been noted by others that the best way to respect the sacrifices made by these Tibetan martyrs is to actively support the cause they gave their lives for, that means advocating, protesting for Tibetan independence. 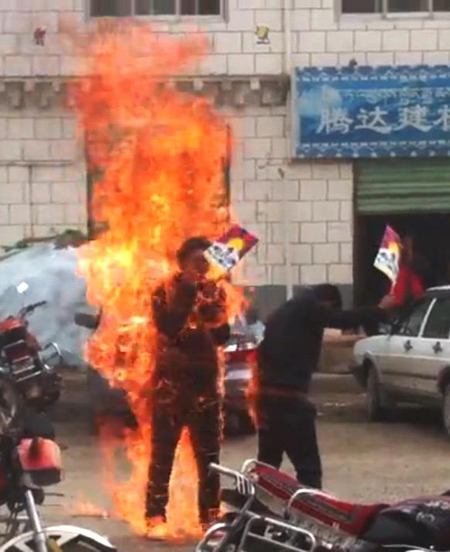 Yet even as the harrowing images of self-immolation emerge from Tibet, and reports document such protests demanding Tibet’s national freedom, the momentum to promote the policy which would accept Chinese rule with limited and cosmetic improvements in autonomy goes on regardless, trampling over the charred remains of Tibet’s heroes.